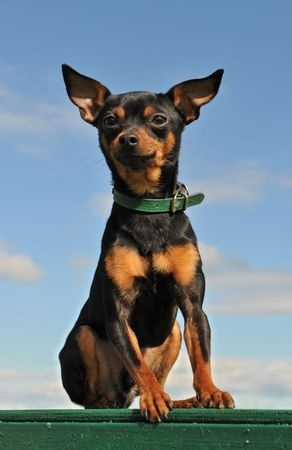 The miniature pinscher is a little dog, weighing in usually between only 8 and 10 pounds and standing between 10 and 12 inches high, with a whole lot of intelligence and a little bit of attitude. These may not be the right pup for a first-time dog owner, since they are liable to dart away from you if they’re off their leash or out the front door when it’s opened – they are just that curious and intelligent! Miniature pinschers are great pets for families with older children, but the small size of the breed makes this dog a tough sell for younger children. They might not handle the accidental roughness that younger kids can sometimes inflict during play time. This breed – which is similar in look to the Doberman, though they aren’t related – was first bred to hunt rats and other vermin in Germany, notes Dogtime, which is likely how their small size came in handy. They were aggressive enough to stalk down these pests and small enough to get into small holes and burrows where the creatures lived. For this same reason, though, your miniature pinscher will be liable to snack on small-sized objects lying around the house, so make sure to keep a close eye on him or her! And, if you have other small pets around, keep them out of harm’s way – your pup will likely view them as prey. Miniature pinschers also tend to respond well to training and socialization, and if they’re socialized early on, they’ll get along well with other dogs in the neighborhood. They are known for their curiosity, energy and protective nature, and are super playful pets. These pups don’t have a lot of fur coverage, though, so they’ll be cold in the winter months. It might be a good idea to invest in a sweater to keep your miniature pinscher toasty in the frigid season. Miniature pinschers are just one of the many small and toy breed puppies available at Pauley’s Pups. For more information on our puppies or to learn more about miniatures pinschers or any other of our great puppies for sale, contact us today!